When you install the Ablebits product and the following informational message pops up once the installation process is complete, you may not see the Ablebits tabs in the Ribbon after starting Excel and the add-in will hardly appear in the list of COM Add-ins. The issue happens due to specificities of the Office version installed from Microsoft Store which is run from the sandbox with its own data registry. If you use such a version of Office on your machine, the add-in can't be loaded automatically. In this case please take the steps below to manually add the Ablebits program into Excel. Launch Excel and open a blank workbook. Click File in the top left corner, and then select Account from the menu on the left. Click File in the Excel Ribbon again and go to Options. Choose Add-ins on the left side of the Excel Options dialog window. Note. If you can't find the AppData folder, it may be hidden. To make it visible, please go to Control Panel -> Folder Options, switch to the View tab, select the "Show hidden files, folders, and drives" option and click OK. If you have difficulties on any of the above steps or the instructions don't work for you, please leave your comment below or contact us at support@ablebits.com. Our support service assistants will do their best to help you solve the problem. 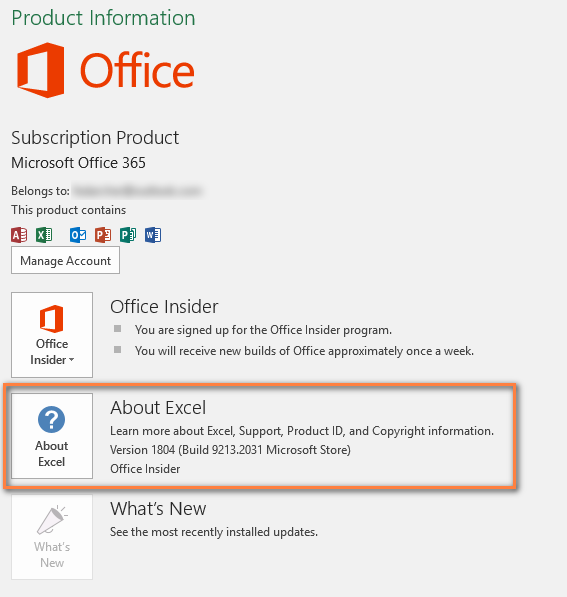 14 Responses to "How to load the Ablebits add-in in Office 365 installed from Microsoft Store"
FYI - Im on Office 365 64 Office Insider build 16.0.10211.20004 and it says runtime error. When I reinstall the 2 tabs show up in excel but are blank. I'm having the same problem. Adding the tools to the quick access toolbar makes them show up and they work, but the ribbon tabs are blank/empty. Thank you for reporting about this problem. Your feedback is highly appreciated and makes our team constantly update and improve the product. The point is that you are using the Insider version of Microsoft Office that is initially a beta version. Unfortunately, we are unable to support each Insider build because Microsoft publishes them once or twice a week. Currently we synchronize all our updates with those Office versions that are available in the Monthly and Semi-annual update channels. However, our developers have already fixed the issue you reported and by now the updated version of Ultimate Suite is available for download on our website. Sorry for any inconvenience that might be caused to you by this. I purchased AbleBits about a year ago for Excel 365. The add-on no longer appears in my version of excel. I followed the above instructions in order to "re-load". the Ablebits.com Ultimate Suite is listed in my com add-ins, but the box is unchecked. When I then try to install the adxloader64.dll I receive an error message saying this is not a valid Office add-on. Thank you for contacting us. I’m really sorry that you are having difficulty with our software. Please go to File -> Options -> Add-ins, select "COM Add-ins" from the "Manage" drop-down list at the bottom of the window and click Go. Find the Ablebits product in the list, select it and send us the screenshot of the window you see to support@ablebits.com. I have tried to manually add the ablebits add in and nothing shows up in the excel ribbon. Any suggestions. It was working fine and today Sept 15 it just disappeared. I'm very sorry to hear that you're having difficulties with our product. 1 Go to File -> Options -> Add-ins, open the "Manage" drop-down list at the bottom of the window, select "Disabled Items" and click Go. If you see the Ablebits add-in in the list, select it and click the 'Enable' button. 2 Go to File -> Options -> Add-ins again, select "COM Add-ins" from the "Manage" drop-down list and click Go. Find the Ablebits add-in in the list. If it is unchecked, check it and click OK. If these steps don't work for you, please contact our support service team, support@ablebits.com, for further assistance. when following the instructions, i do not get checkbox to enable add in. Please, explain me how to get this resolved. - Go to File -> Options in your Excel and choose Add-ins on the left side of the Excel Options dialog window. - Find and select adxloader.dll for your 32-bit Excel and click Go. - Wait for a few seconds for the add-in to add to your COM Add-ins list. Once you see it in the COM Add-ins dialog box, please check it and and click OK.
- Make sure there are new Ablebits tabs in your Excel Ribbon. If, however, the steps above don't help, please contact us at support@ablebits.com for further assistance. Sorry, IBP Add-in for Excel is not our product, you'd better contact the add-in's vendor for assistance. I purchase Ablebits on Jan 24/19, registered and everything was fine. Went to use it yesterday, and it was no longer on the ribbon. So I have followed the instructions to get it back. When clicking on the box for it in Com Add-ins, nothing would happen. So I have re-installed, after unistalling, now the box does not exist. When I attempt to add and navigate to C:\Users\USER_NAME\AppData\Roaming\Ablebits\Ultimate Suite for Microsoft Excel, the folder is empty. I navigated to it also from Explorer and it is empty. Please help, I have a project due that requires some of the tools. Sorry to hear that you are having difficulties with our product. The point is that the installation directory for the latest version of Ultimate Suite has been changed. 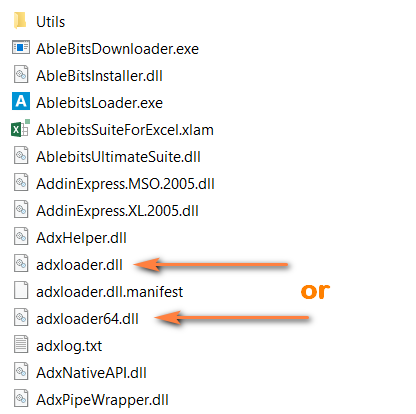 Please look at C:\Users\USER_NAME\AppData\Local\Ablebits\Ultimate Suite for Microsoft Excel. If this doesn't help, then please contact our tech support service at support@ablebits.com for further assistance.